Whenever I visit the Veneto region of Italy, I get carried away by the beauty and romance of the city of Venice with its canals and waterways. The palaces, churches and gondolas. The blue-green waters of the lagoon. All these elements provide a potent cocktail for the senses, a heady mixture of delicious views, and magical sounds. To really understand north-eastern Italy and the Veneto and Friuli Venezia Giulia regions it is important to go back in time thousands of years. To at least 5000 years ago when small groups of hunter-gatherers moved north into Europe from the Middle East. These small tribal groups settled in the delta of the River Po and around the edge of the Venetian lagoon. They started to farm the land, catch fish from the Adriatic Sea and build simple houses. The Veneti were one of the most successful of these groups. They gave their name to this part of Italy and were the earliest settlers here. The first real challenge they had came from the Romans, who ventured into north-eastern Italy around 300 BC. As the Roman Empire expanded it became imperative for the Romans to secure the borders of their growing territory. The best way to do this was to forge ‘friendships’ with local tribes. The canny Veneti co-operated with the Romans and made several ‘amicizia’ friendship pacts with them thus securing their future as citizens of the Roman Empire. 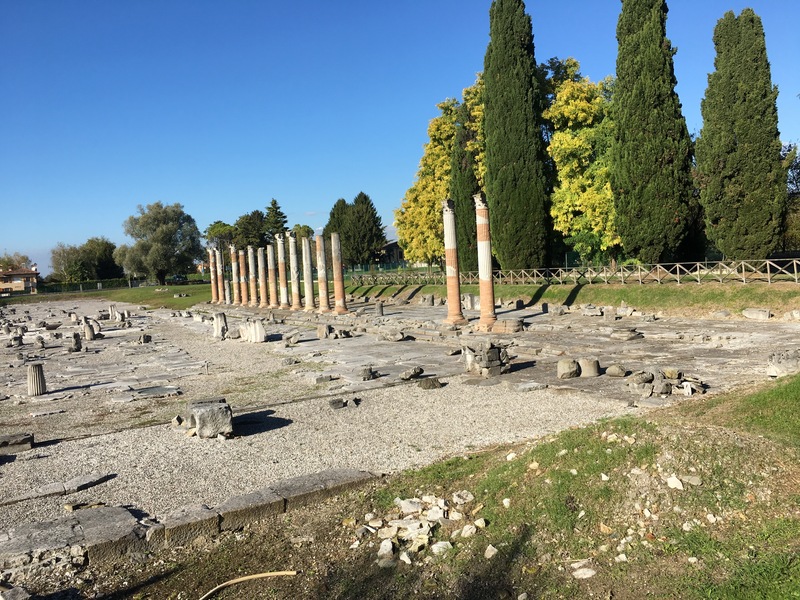 I was lucky enough to visit the amazing Roman city of Aquileia for the first time in 2016. The city is a treasure trove of active archaeological sites and spectacular early Christian mosaics. The Romans had effectively developed the cities of Aquileia, Concordia and Altinum as important centres of trade, around the edge of the Venetian Lagoon, by 200 BC. These towns had military garrisons, port facilities, and access to the nearby Adriatic and Mediterranean Seas. By 100 AD the Roman citizens of Aquileia lived in a well-planned city. There was a large Roman Forum, River Port (Porto Fluviale), baths, shops, houses and an amphitheatre. 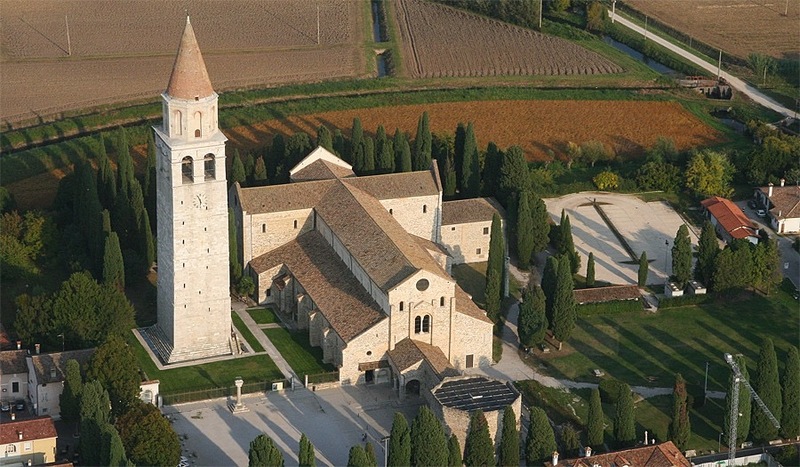 Today Aquileia is one of the largest and most active archaeological sites in Italy. There is excavation work going on everywhere. Within an hour of arriving I’d counted at least six teams of archaeologists working in different areas of the town. In Altinum, another Roman city much closer to Venice recent archaeological work suggests that Torcello, an island in the Venetian lagoon, was in fact the sea port for Altinum. If this is the case, which seems quite likely, then the older floor mosaics, in the cathedral of Torcello are probably contemporary with those of Aquileia. 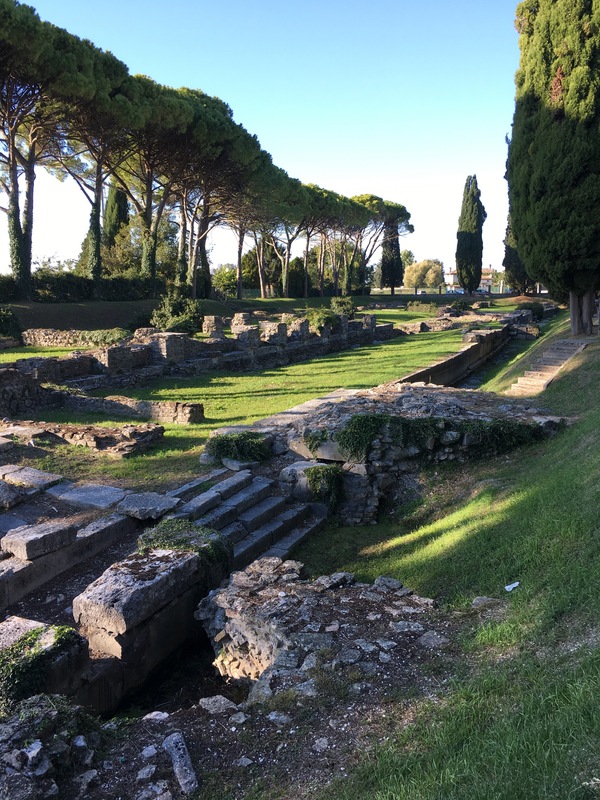 This is the Roman Forum in Aquileia, located in modern day Friuli Venezia Giulia. This is the place where citizens would meet each morning to buy and sell goods, chat about recent events or hire workers for the day. Here in the Forum politicians and merchants would talk to their friends and competitors, negotiate deals, discuss politics and try to increase their influence locally or perhaps even in Rome. Just around the corner from the Forum is the Porto Fluviale, the old river port of Aquileia. This port was a busy place in Roman times, located just a few miles from the Adriatic Sea. The river would have been bustling with boats loading and unloading goods. Aquileia exported olive oil, wine and glass to southern ports like Ancona, Bari and Brindisi. Archaeologists have unearthed foundations and walls of piers, loading areas, workshops, warehouses and docking areas. There were also studios making ‘tesserae’ the small coloured pieces of ceramic tiles used in the making of mosaic floors and ceilings. The remains of the ‘Old Port’ ‘porto fluviale’ are very extensive, the channels, unloading points and storage sheds (foundations) are clearly visible. The most spectacular part of the extensive remains at Aquileia is probably the Roman mosaic floor found underneath the Basilica of Santa Maria Assunta. This floor dates from the 4th century AD. Christianity became the official religion of the Roman Empire with the Edict of Milan in 313 AD. So immediately we know that these mosaics are very early examples of Christian symbols and stories. The mosaics tell a variety of early Christian tales, in a clear and ‘easy to understand’ way. It is worth taking time to look carefully at the people, animals and fish depicted. There are fishermen, in a boat hauling in their catch. The seasons are depicted too. There is even some humour, representations of a hare and tortoise for example. The basilica complex is also impressive, the campanile (bell tower) was built in the 11th century and can be seen for miles in every direction. The Roman mosaics are the most extensive early Christian examples in the whole of Italy. People, seasons, animals, birds and fish are depicted with exceptional accuracy and artistry. The wonders of this basilica do not end with the mosaics. In the crypt under the main alter there are frescoes, showing various scenes from the life of Christ. The faces of the people show true emotion, they are very realistic and powerful. We were also lucky enough to visit the ‘scavi’ ruins underneath the foundations of the Campanile (Bell Tower). This was a first for me I’ve never had the opportunity to explore several metres below the foundations of a huge stone structure. This enabled us to appreciate the vast extent of the mosaic flooring at this site. It is also a ‘live’ archaeological site, in one area we could see various fragments of ceramics, and mosaic, recently unearthed and carefully cleaned with a small brush. These fragments are then left ‘in situ’ numbered, photographed and sketched before moving them to a lab or storeroom for further investigation. It is unusual to see an archaeological dig in action these days, as I mentioned before in Aquileia there are at least six ‘live’ sites. The photo below shows these mosaics, the support pillars and another glass walkway giving the visitor an optimal viewing perspective. Just a few years ago a team of archaeologists discovered the remains of an acqueduct bringing water into the centre of the city of Aquileia. More discoveries will be made in the coming months and years. A hard morning of history has to be followed by a really good lunch. We wandered into town, passing the Archaeological Museum on our way. We walked the length of a small canal, leading out to Grado and the Adriatic Sea. Then we came across just what I was looking for. A typical, family-run locanda offering several choices of home-made pasta with various sauces. Just what was required! The succession of people who have inhabited this area from the Veneti tribes to the highly organised Romans and then on to the merchants and diplomats of the Venetian Republic, have all left their mark on this fascinating and culturally rich area. But in my opinion the pioneer spirit of the Veneti, the early settlers, is still here in the spirit and independence of the Venetian people of today. Their loyalty to their region, their love of the Veneto and their attitude, which is always Venetian first and Italian second. This sense of regional identity always makes me smile with admiration – every time I see it. The Friuli Venezia Giulia region is a ‘must visit’ destination in 2018. Enjoy! This is an area to discover in 2018 – a treasure trove of wonderful mosaics, fantastic scenery and architecture. For a little more on the Roman ‘development’ of Aquileia: In 181 BC a Roman triumvirate of Publius Cornelius Scipio Nasica, Caius Flaminius, and Lucius Manlius Acidinus founded a Latin colony at Aquileia as a base to protect the territory of the Veneti from incursions of the hostile Carni and Histri. From then on, Roman influence over the area increased. In 169 BC 1,500 more colonising families were sent by Rome to Aquileia. In 148 BC the Via Postumia was completed connecting Aquileia to Genoa. In 131 BC, the Via Annia joined Adria to Patavium (modern Padua) to Altinum to Concordia to Aquileia. The Via Postumia was an incredible feat of engineering – a road that ran from Genova in the west to Aquileia in the east, effectively linking two of Imperial Rome’s most important ports. Oh, Janet, you’ve done it again! I remember so much of our day in Aquileia, and your photos and writing bring it all back. We were so fortunate to have chosen you, The Educated Traveller, to guide us on our way. Thank you!